Synopsis: The Puzzle Boxes are becoming obsolete gateways to Hell, but before the matter is fully addressed, a dark detective unwittingly finds his way to Hell’s doorstep. • While the recast Pinhead (Paul T. Taylor) just passes muster, new characters like the Auditor (Gary J. Tunnicliffe) of the Inquisition were a delightfully guilty pleasure. The Auditor’s slightly differing perspective was especially interesting just before Pinhead himself was judged at the end. • The judgement placed upon Pinhead for his unwise arrogance by light itself, possibly referencing his apparent demise in the future. • Most of the characters were given notable depth, as they were all likable in some way. • The overall aim of expanding the mythology was largely successful, while highlighting how Pinhead definitely still does not care what God thinks. • The allusions to Brazil (1985) were well implemented and not overdone. • The final scenes were quite satisfying, making the viewer want to see what Pinhead will have to do next. 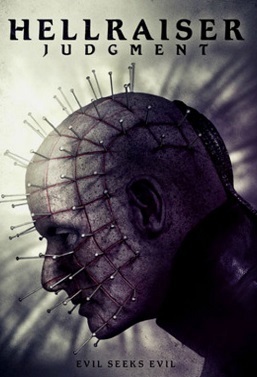 • Doug Bradley’s nuance was missed in this film’s rendition of Pinhead. • The deliberate police procedural pacing made the overall film feel a bit slow at times. • The wildly grotesque visuals might have been too much even for fans of the series. • The ultimate murderer was somewhat predictable. After a series of prequel-sequels that leave the memory of passing out, we finally are given Judgment: a Hellraiser film that dared to move the franchise forward again. Even before recovering his human memories — perhaps even before becoming the reigning Hell Priest of Leviathan’s Cenobites, Pinhead was never someone that cared what God or anyone else thought. Such a mentality certainly played well in his role as one that provided sadomasochistic pleasures to those delivered onto him, and perhaps was a key reason why Leviathan remade him into a chief Cenobite. As far back as Hell on Earth, however, it was suggested that such self-centeredness could also be his greatest weakness. By 2018, so much of humanity developed technologically fueled self-centeredness that might just be forcing them to find another means of soul harvesting instead of an 18th century Puzzle Box. It would seem that God had plans already, but largely in opposition to at least the newly introduced Inquisition and well known Cenobites. Of course, Pinhead let out his frustrations on the wrong being, under the self-centered assumption that there was no consequence he could not endure. That is all not to mention the scene steeling Inquisition, which ensured a fun uniqueness the film would have otherwise lacked. Judgment may have been very slow and overly ultraviolent at times, but it had a worthwhile story to tell.